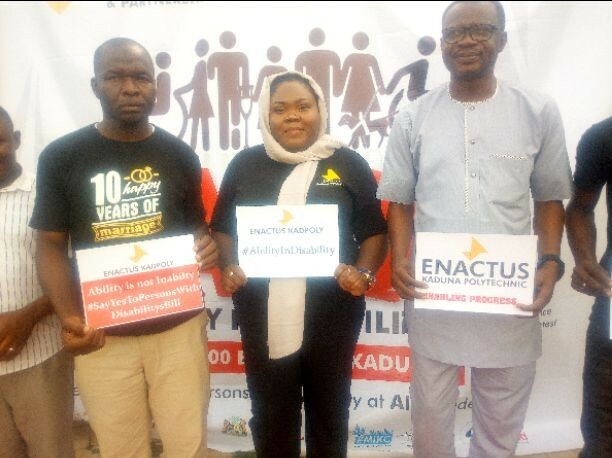 A Student non-governmental organisation, Enactus Kaduna Polytechnic in partnership with Kaduna State Board of Rehabilitation with support from Partnership to Engage, Reform and Learn (PERL) on Sunday launched a project called Ability in Disability (AID) in Kaduna state. AID project is an innovation of Enactus Kaduna Polytechnic complementing efforts of the government and other organisations working around empowerment of people with disabilities (PWD) to reduce their dependency. One of the beneficiaries, Muhammed Iya, 30, deaf but intelligent, trained in paint making said, the students group has helped him to learn the trade, saying he’s now selling and making money to help himself and his family. Muhammed, who spoke through sign language interpreter, Sarah, called on good people of the state to rally support for the speedy passage of a bill that will assist PWD to access public infrastructure like schools, and transportation. “Enactus helped me to learn paint making and I have done that successfully and I am now selling quality paint in different colours. “I can also do what we call colour mix for customers who want customised colour. Earlier in an address, Team Leader, Enactus, Kaduna Polytechnic, Shakirah Alaga told newsmen that, the launching of AID project in Kaduna became necessary to address some of challenges facing PWD in Kaduna State. “We are a group of students showing students how to develop entrepreneurial mindset away from usual way of productivity where people have to wait for someone else to employ them before them can impact their communities positively and we are doing this through economic, environment and social impartation. “We at Enactus are saying instead, why can’t we see how to put our expertise together to impact lives positively in our own little way as students and as young Nigerians. “Like I said, we are a students non-governmental organisation that trains students on entrepreneur, teaching them how to think outside the box. “Today, we are launching a project called Ability in Disability (AID) here in Kaduna, aiming at eradicating stereotype around PWD. She continued, “we also want to use the opportunity to reach out to those who have one role or the other in passage of PWD Bill here in Kaduna so these people too can enjoy what other citizens are enjoying. “We want to specifically call on our, Governor, Malam Nasir Elrufai, his commissioners and honourable members in Kaduna State House of Assembly, to see to the quick passage of PWD Bill. “We are also coming up with the opening of training centres across the country to take care of those that are disabled and jobless. This will in turn reduce number of beggars in our streets across the country”, she opined.